Introduction: One of the many things that I have come across in my reading of many YA/Children's books is that there appears to be a slight gap in the science fiction literature written for that specific age group. While there might be the occasional space travel, or alien there isn't really a lot of books that are aimed at that age level that would really be science fiction. Many sci-fi books might read as a YA book but while they might be written in a style that could be YA are more for the adults then middle school or teen level of reading. When I came across "The Softwire" series I was interested in seeing how the various concept were going to be presented in this book. As a reader of fantasy series, my experience with this series was overall surprising. Overview: The children on board the ship Renaissance have only known what life was like traveling through space for the better part of 12 years. Their parents have all died in a freak accident that left them orphaned. In a strange twist of events the parents left the children in nourishing pods to be "born" only if something were to happen to them. The adults of the Renaissance had made an agreement with the Council on Orbis, an advanced interplanetary plant that is known for the great life that is promises, that if the parents worked on the four rings of Orbis after four years they would be granted the chance to citizenship on Orbis and be able to lead a great life. However since the adults have all died when the children arrive at Orbis they are required to fulfill the agreement that their parents had promised. The children of the Renaissance must live a slave-life lifestyle, working one year on each of the rings of Orbis, if after that period of time their work is deemed acceptable they are allowed to become full fledged citizens of Orbis. Orbis is an advanced technology state in that everything is run by a central computer system that controls everything from the food that is distributed to the security of the doors in all the buildings. JT and his sister, Ketheria are two of the children on board the Renaissance and are forced to work sorting out junk parts for one of the higher citizens of Orbis. JT has always thought it was strange that he could communicate with the "mother" computer on board the Renaissance but as he had known no other life besides the one on board he thought this was normal. When he lands on Orbis he finds out he is a rare human known as a "Softwire", who is capable of linking up to any computer by just using his mind. Coinciding with JT's arrival on Orbis, the central computer system has started going crazy. It started slowly with small problems such as doors not opening and computer mix ups, and slowly started progressing until it became so obvious it was impossible for the people of Orbis to ignore anymore. Many people believe that JT is the reason for all these problems because he is a Softwire, however while traveling through the computer system JT notices a virus has been planted into the central computer. JT must try to convince the people of Orbis that he isn't the blame for the problems and that someone else is out to destroy Orbis. The virus has started many fights between the Keepers, the rulers of Orbis and the Trading Council, a group that wishes to rule Orbis. Both groups have an interest in JT, only which one wants him to help and which one wishes to see him dead is something JT must figure out. Analysis: While PJ Haarsma's Softwire series began back in 2006, I hadn't heard much about it. As a matter of fact I was beginning to wonder if anyone would tempt to take on sci-fi for a younger audience besides the typical alien visitors to earth. What Haarsma created is not only unique but captivating at the same time. Haarsma has created a unique world that is appealing to both adults and children. There are many various alien like creatures on the planet of Orbis, and there is also the humans that have arrived on the ship. The integration of the two species together is done very well and many of the characters that readers come into contact with appear to be pretty thought out. There are times when the characters do appear a bit rushed or hurried, but the main characters of JT and his sister are very three dimensional. The background of the characters and some of their trails and issues they encounter are life like and real. The creation of the world of Orbis is another excellently done area of the book. The descriptions of the buildings and technology that is used are very detailed, and are easily able to be followed by any reader. There are no maps or pictures throughout the novel, but I could visualize everything that was described in my head. The technology that was involved in the book wasn't so complex that it got overwhelming or too confusing, sometimes when technology is involved readers almost feel like they need a degree in Information systems to understand what is going on. On the other hand, the technology isn't so watered down that it felt like the readers were being talked down to. There are some gaps or downfalls with Virus on Orbis 1 that I encountered in my reading. First was the reaction of the Citizens of Orbis to the virus threat. Whenever JT would bring up the subject of the virus, the aliens response was along the lines of "The computer runs all it'll tell us if there's a problem". I couldn't understand why that was the reaction. If the technology was so advanced that it would alert to a problem, shouldn't someone have known that there could be a problem? Maybe the citizens of Orbis just got too comfortable and were lulled into a false sense of security but it was a question that kept nagging me while I was reading the novel. There were also other slight gaps in the story line, such as JT being placed in holding because he could be the problem and then magically he's let out and no one seems to be overly worried about him being the cause. While not a major problem with the book there were occasional gaps in the story that an older reader might notice but a younger reader wouldn't even think twice about it. The second gap weakness of the book was what occurred at the ending. The events that happened within the last couple of pages just seemed to pop out of nowhere. There was not a bit of foreshadowing in the previous chapters and with what happened it almost seemed like there would have been some sign or knowledge of it before hand or at least some way to let the reader know it might be a possibility. The last weakness that I encountered was that of the pacing of the book. Virus on Orbis 1 started out with a real bang and the novel just seemed to speed along, but once the virus was discovered the pacing seemed to drag a little. It wasn't until the last couple of pages that the pace really sped back up again. In the end, some of the story lines gaps and unexplainable reactions might turn off a more experienced reader of sci-fi/fantasy. 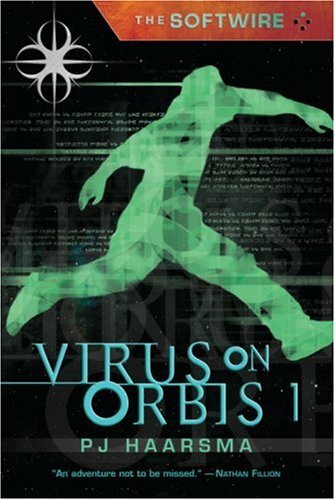 However The Softwire: Virus on Orbis 1 was a great novel to introduce readers to what could be out there in the sci-fi world, something that I hope other authors won't be as afraid to try. PJ Haarsma does a great job on what was his debut novel (He has since wrote 2 other books in the Softwire series) and it would be interesting to see where he takes the creativity in his other novels. The Softwire is definitely a series to check out if you are looking for a sci-fi adventure series that isn't too heavy or complicated.